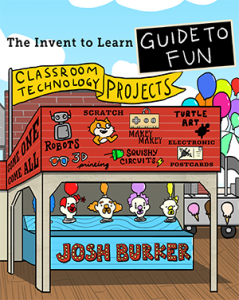 Insanely clever classroom technology projects come to life in this book by educator Josh Burker. The Invent To Learn Guide to Fun leads teachers, parents, and kids of all ages through a series of projects designed for maximum learning and fun! Thirteen projects explore innovative software and hardware, upcycled material, and your imagination! Combine simple electronics with LEGO bricks, 3D printing with clay tiles, computers with cardboard, and more. Visit the Invent To Learn Guide to Fun website for more. Experiments Use homemade dough to experiment with electricity. LEGO ArtBots Scratch computer, LEGO WeDo Kit Build a robot that makes art! Animated Postcards Paper and electronics combine to make fun greeting cards with lights, and then animate them! MaKey MaKey Musical Instruments Scratch computer, MaKey MaKey Upcycle cardboard to make a an orchestra of instruments like no others. MaKey MaKey Operation Game Scratch computer, MaKey MaKey Build your own “Operation” game. Soft Circuit Stuffed Animals Sew together a new friend with glowing eyes and a light up heart of gold. TurtleArt Experiments TurtleArt computer Play with the turtle to draw amazing geometric patterns. Glowdoodlers Glowdoodle, TinkerCAD* computer, 3D Printer* Create electronic paintbrushes and paint with light and color. Chain Reaction Machines Scratch LEGO WeDo, computer Build a contraption that would amaze Rube Goldberg. The chain reaction weaves from the real world on to the computer and back to the real world again! Carnival Games Scratch LEGO WeDo, computer Make a carnival with computer games with controllers you make yourself. Turtle Art Tiles TurtleArt, TinkerCAD computer, 3D Printer Create amazing clay tiles with beautiful geometric patterns. Dungeon Crawl Adventure Game Scratch computer, Picoboard Program your own computer game that responds to light and sounds. Crystal Radio Receiver 3D Printer* The world is full of hidden radio waves! Build your own receiver to explore it. Note: All projects also use a variety of easy-to-find electronics, recyclables, office supplies, and craft materials. See each project for a specific supply list. For volume sales, PO purchases, or international sales, contact CMK Press. This book will be available from local distributors in the U.S, Australia, and the U.K. The Invent to Learn Guide to Making in the K-3 Classroom: Why, How, and Wow!